A recent addition to Jackpoint, he provides the “former runner who got out” perspective, having hired on with a corp fulltime (a popular pursuit for runner’s long-lived enough to receive such an offer). In this case, he also owns the corp: Dynamic Solutions, a prominent international “bodyguards for hire” org. 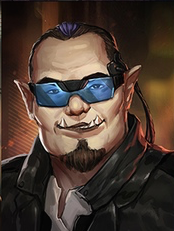 Somewhat self-hating, he often promotes tech that lets orks appear “more human.” Has some beef with Balladeer over the assassin’s killing of a few clients of his.